Nutrition plays an important role in the health of the urinary tract and in the prevention of urinary stones (uroliths). If your dog has a urinary tract infection, be sure to eliminate that infection with antibiotics before using diet to help prevent a re occurrence or dissolve any stones that may have formed. 1. 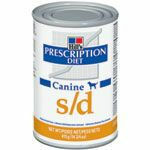 Switch to a canned dog food - these foods have up to 60% more water than dry. 3. Add some salt to your dog's food. A small amount of salt is not harmful to dogs when studied. The U.S. Academy of Sciences indicates that a safe level of sale for dogs is 3.75 g /1000 kcal in a dry food providing 4000 kcal/kg or sodium content of 1.5%. Provide Citrus Based Juice - these juices are high in acid and will increase the acid in the urine itself. High acid levels can help to dissolve one of the two most common urinary stone types - struvite. The other type, calcium oxalate cannot be dissolved this way, however increased water consumption as indicated above can help. Manage Protein Intake - It used to be recommended that dogs eat a low protein diet to avoid stone formation. Recent research contradicts this finding, with researchers now recommending a high protein diet. The key is that not all proteins are digested in the same way. Purine, a substance that is created when the body breaks down protein, is thought to be the cause of stone formation. Foods made to help dog's with urinary stones, select proteins that result in lower levels of purine. Avoid foods that high a high concentration of calcium, phosphorous and magnesium. Dog foods that are made to help stones dissolve are made with low levels of these substances. If your dog suffers from the formation of oxalate stones, Hill's Prescription Diet u/d is a high fiber formulation that may be of help in preventing the problem. No food can dissolve oxalate stones once they form. Royal Canin makes similar products. Royal Canin UC (low purine protein) is made to the standards mentioned above. Royal Canin SO is formulated help dogs that get lower urinary tract diseases and are prone to struvite and oxalate stone formation. This diet prevents crystal formation by changing the PH balance of the dog urine. A urinary tract dog food may take 120 or more days to show progress. Also, while a diet may work for one dog, it may not be as effective for another. When changing your dog's food do so gradually by mixing the new food and old together. Start with 80% old/20% new, then 50%/505, 20%/80% until you make the switch to 100% new. This will make the taste change acceptable to your dog and also help to avoid stomach upset. Homeopathic supplements may also be helpful in helping your dog maintain a normal urine PH while supporting overall urinary system function. Herbs such as Arctostaphylos uva ursi, Berberis vulgaris and Cantharis all have properties that are thought to naturally help. One product that combines all three that is worth researching is PetAlive UTI-Free Formula forpet urinary tract infections.